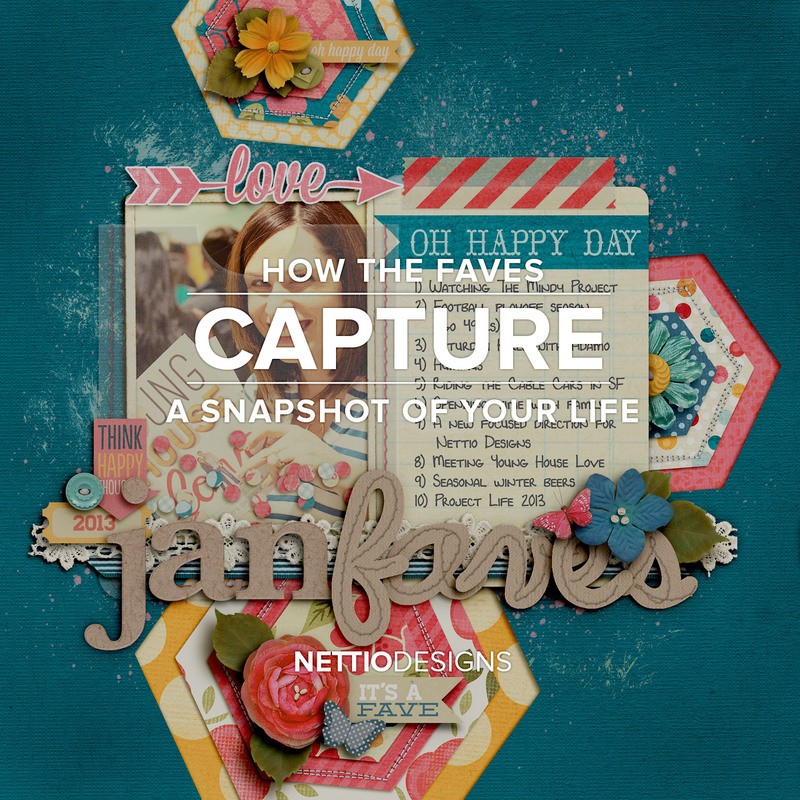 As I mentioned last week, the Faves are back which means The 2015 Monthly Faves Project is well underway here at NettioDesigns HQ. Let me tell you, the ladies who’ve joined me so far are ROCKIN’ the January Faves! Since I shared my Jan Faves layout last week, today I wanted to share some of their amazing layouts with you. And then there’s Jenn with these bright & colorful layout that caught my eye right away. I especially love how she clipped a paper to the “FAVES” title so it has an extra punch of pizazz to it. And finally we have the neutral crew: I had to laugh when I saw all these layouts together because I’ve been on a total cream/neutral background kick with my layouts lately and I love to see that I’m not alone! 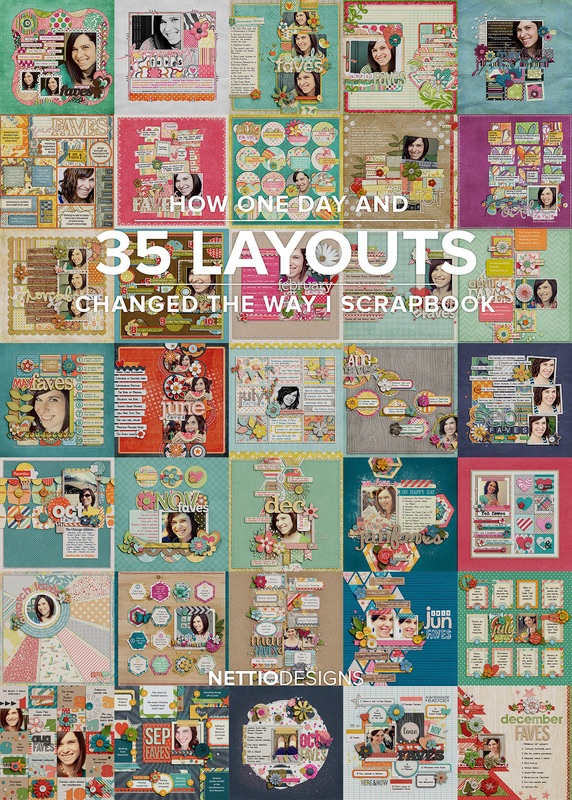 What I think is so awesome about these layouts is that even though they’ve all used the same template, each layout feels unique to them and I love how the colors, patterns and embellishments they’ve each chosen fit their Faves. 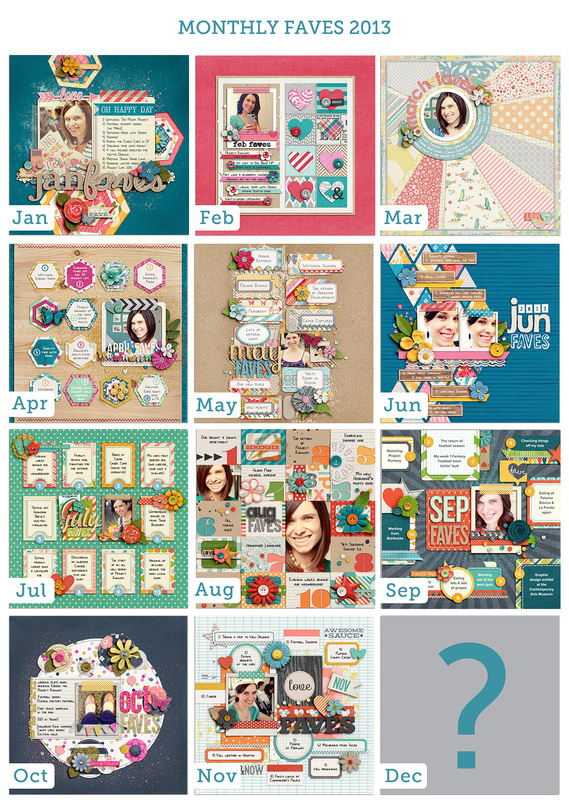 The 2015 Monthly Faves Project is your creative roadmap for getting more of YOU in your scrapbook albums this year. 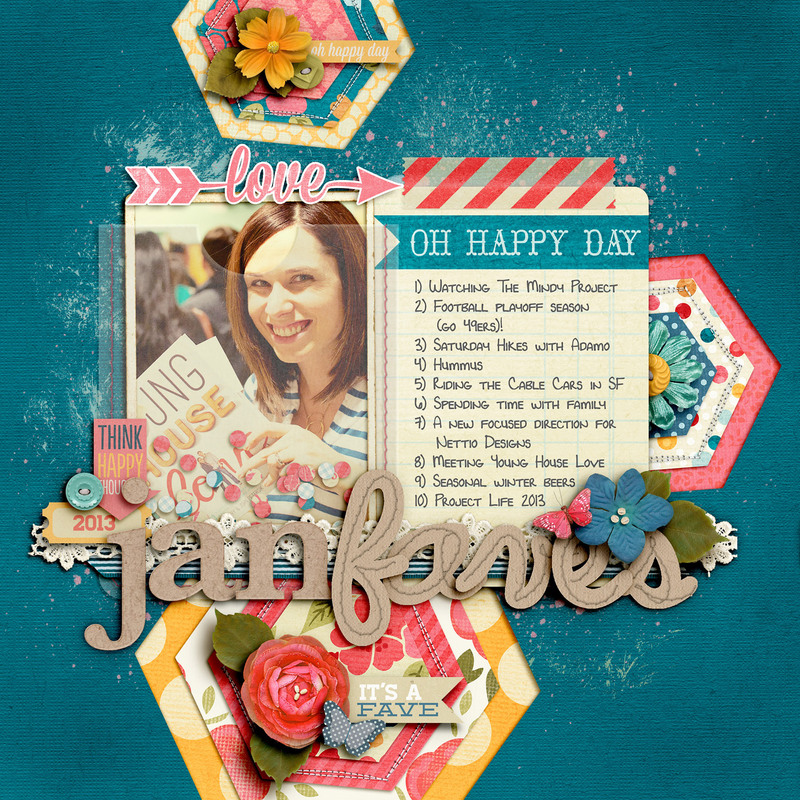 Every month on the 25th, you’ll receive a brand-new exclusive Faves-themed digital scrapbooking template designed by me, as well as a monthly email with tips and access to a private Facebook group where you can get to know all those happy, smiling faces above. 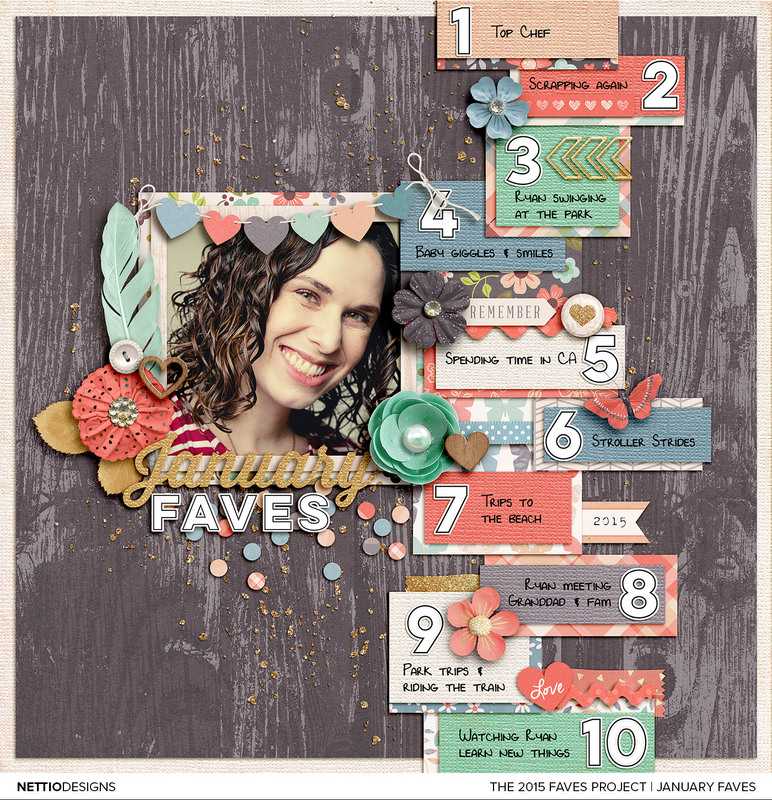 Here’s a peek at the January Faves template you’ll receive when you sign up. 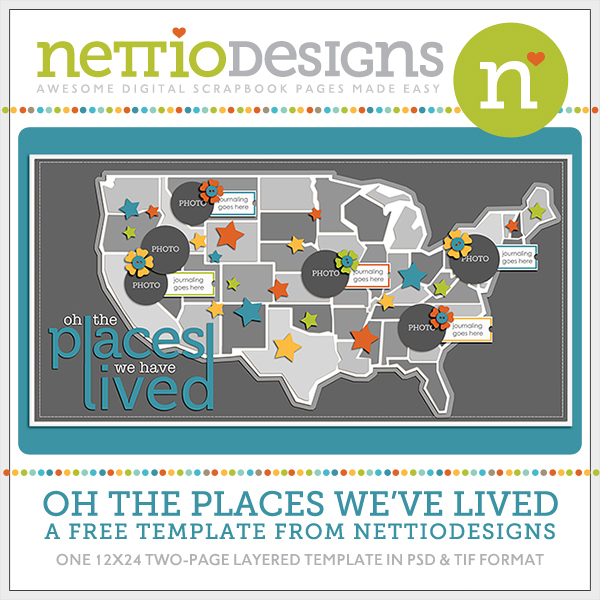 The February template will be released on the 25th which means if you sign up now you’ll receive two templates in the same month. Bonus! 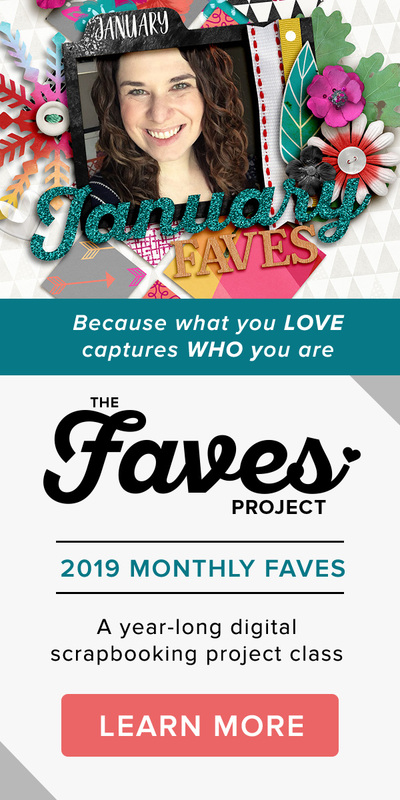 What do you say, want to join us in The 2015 Monthly Faves Project? Sign up here. If you know me, you know that my Monthly Faves project has kind of become an odd-numbered year thing around here. And since this is 2015, you know what that means: the Monthly Faves are back! 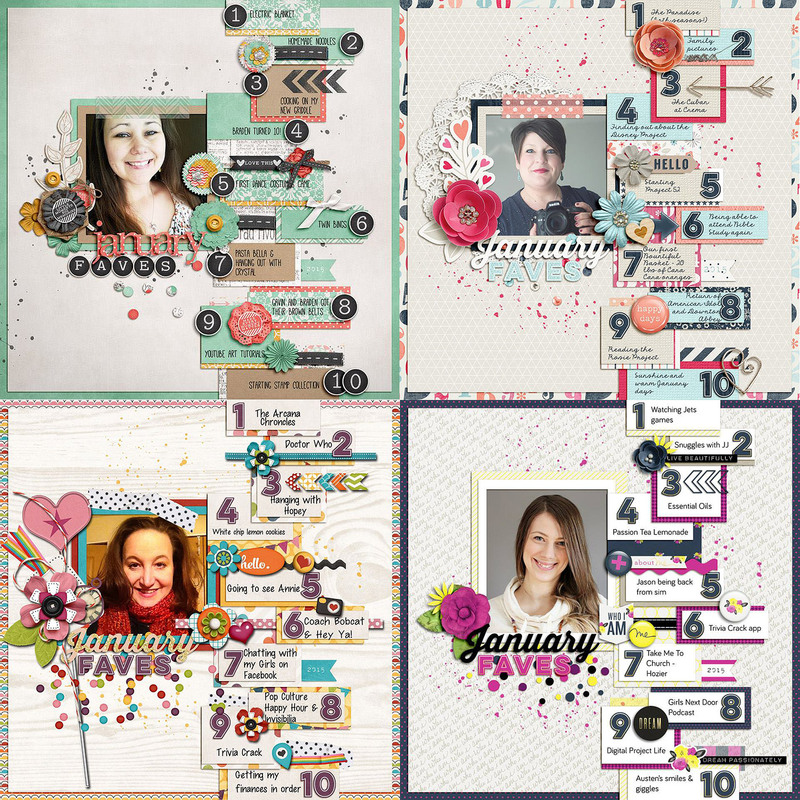 This year instead of going it alone, I’m inviting you to join me as part of the 2015 Monthly Faves Project: a year-long digital scrapbooking workshop designed to help you get more of YOU in your albums. 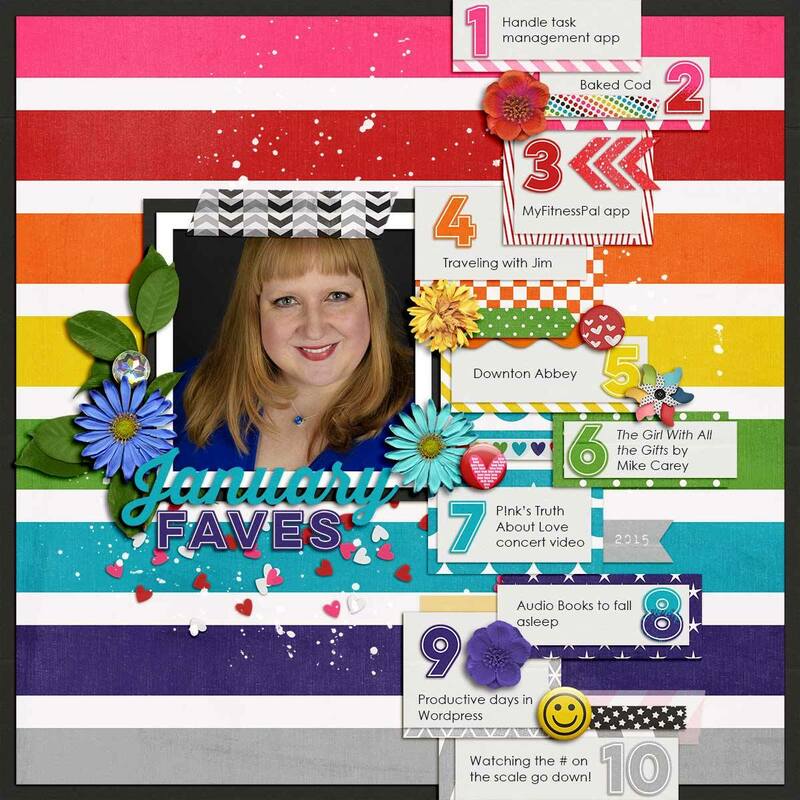 When you sign up for the 2015 Monthly Faves Project, in addition to an exclusive digital scrapbooking Monthly Faves-themed template designed by me, you’ll also receive a monthly email from me with tips & inspiration and access to a private Facebook group where you can share your work and connect with me and other Faves Project scrapbookers. Because a top ten list is one of the easiest forms of journaling you can do. I can tell you I’m excited about the return of the Faves but really you should just picture me over here doing a happy dance to Pharrell’s Happy because that’s how excited to be doing this project once more. Want to join me on this fave-tastic scrapbooking adventure? 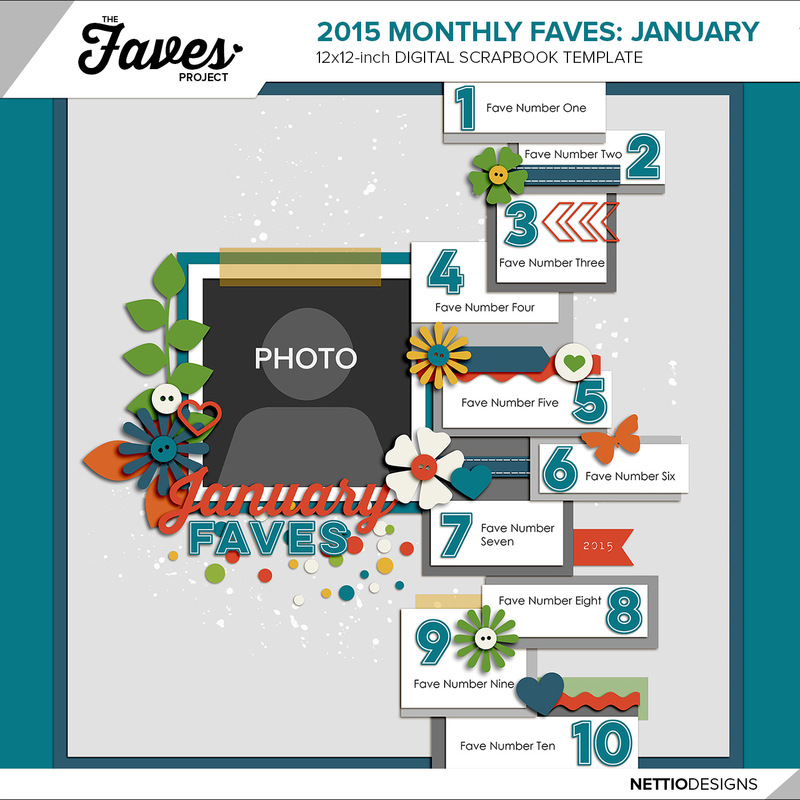 Sign up for the 2015 Monthly Faves Project here. 2015 will be my fourth time doing my Monthly Faves project, after doing it in 2009, 2011 & 2013. So what is it about this project that keeps me coming back for more? Well, one of my favorite things about The Faves Project is how my faves layouts capture a snapshot of my life. So today I wanted to show you how they do exactly that. A couple of notables on my list: driving the Murano again (aka my car referenced in the first layout) and reading Young House Love, which I’m pretty sure was my newest crafty/decor blog obsession at the time. Well, look at that, Number 8 on my list is Meeting Young House Love. In the two years since I discovered their blog I went from new fan to actually meeting them at a book signing. How cool is that? 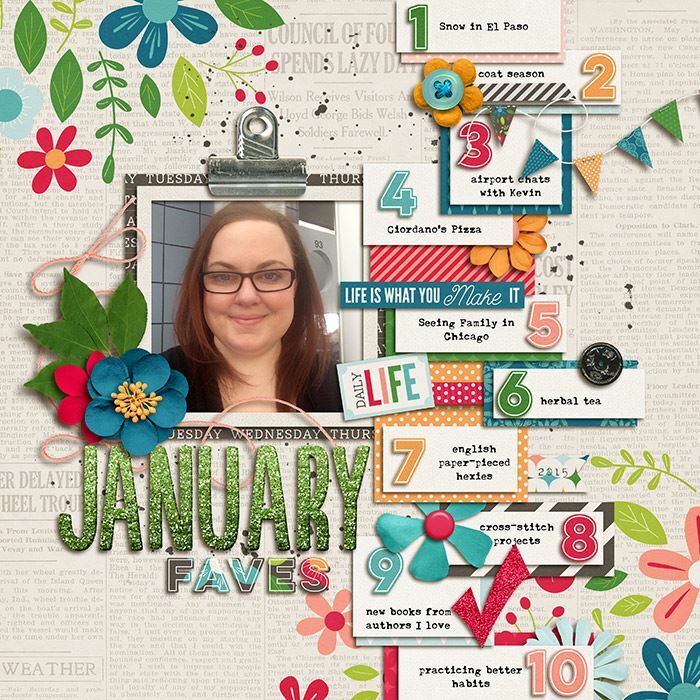 I’m not ready to share my January 2015 layout just yet but, spoiler alert, my Faves list includes Top Chef, which oh yes, appears on my very first January Faves layout from 2006. Seeing these layouts – ten faves, two, four and eventually six years apart – reminds why I LOVE these Faves layouts so very much. And yet when I look at these layouts, I’m reminded again that, while my world around me may have changed , so much about me has remained the same. Like my love for driving my Nissan Murano, home decor blogs and reality TV. This is why I love the Faves. If I were to ask you today what your top-ten favorite things were back in January 2009, would you be able to tell me? Lord knows I wouldn’t be able to remember. But the beauty of these Faves layouts is I don’t have to. Because my Faves? They are right there on these layouts capturing a mini snapshot of what my life is like right then and documenting all those little bits and pieces that would otherwise be forgotten. Those little bits that truly make up who we are. And that right there, my friend, is what scrapbooking is all about. The Faves express is on it’s way! On Monday February 9th, The Faves Project: 2015 Monthly Faves will be going live! Want to get it in the ground floor? Get yourself on the exclusive Faves Project list. You’ll be the first to hear when it opens and may even get a special bonus when you sign up. 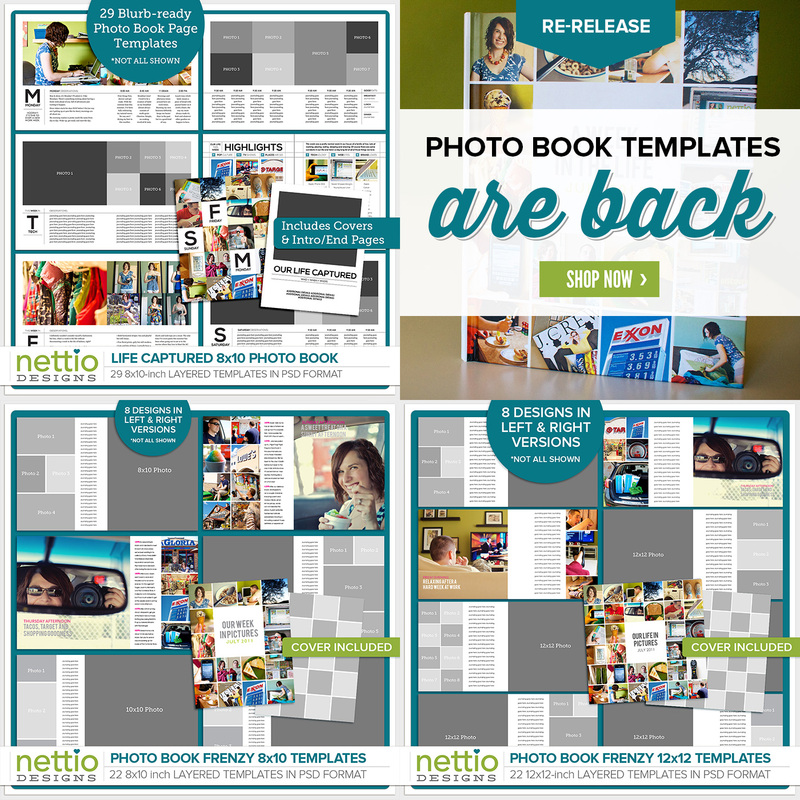 Let’s chat about your scrapbooking albums for a second. When you look at them, what do you see? Your family? Your travels? Your everyday life? Now take a closer look. If you had to take a guess, what percentage of your layouts would you say capture YOUR personal story? As in, how many pages are actually about you? Me? I’d say 75%. But I’ve also had the luxury of being a child-free scrapbooker for the last eight and half years before my son was born last June. Odds are if you’re like 99% of scrapbookers out there, your albums are full of adorable kid photos, family adventures and not a whole lot of you. 1) You think your story is boring. As a new mom, I totally get it. When so much of your life is wrapped up in taking care of someone else, it can be tough to step back and think about yourself. We get caught up in the monotony of day-to-day life and assume that routine=boring. But I’d argue that your life isn’t boring, it’s normal. And despite what you might think, normal doesn’t mean you don’t have a story worth sharing. 2) You don’t like having your photo taken. Ah, the irony that is the scrapbooker who takes photos of everyone but themselves. What’s that they say about the cobbler having no shoes? 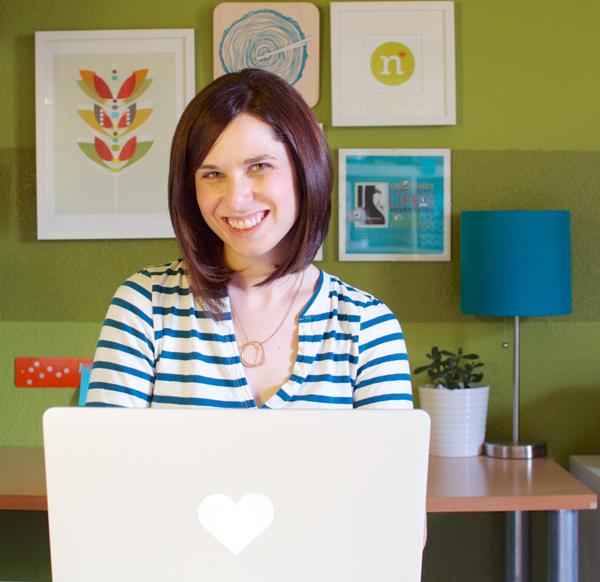 If you’re a camera-shy scrapbooker, know this: you aren’t alone. In fact, I’d say not being in photos is one of the most common reasons scrapbookers give for not scrapbooking themselves. What you need is a reason to get yourself out from behind the camera. Because I promise you, it’s nowhere near as scary as you make it out to be in your head. 3) You don’t have time to scrapbook yourself. Ah, time. In a world that glorifies busy as a badge of honor, taking time for yourself can feel like a luxury. Even with something like scrapbooking, you might feel pressure to focus on the stories of everyone else around you and let your own story fall by the wayside. This is why so many scrapbookers are convinced that telling their own personal story is hard. Because it feels like it’s going to take extra effort and time they don’t have for an end result they can’t picture. Because when you have a plan in place that makes it easy for you to capture your story, scrapbooking yourself no longer feels hard. 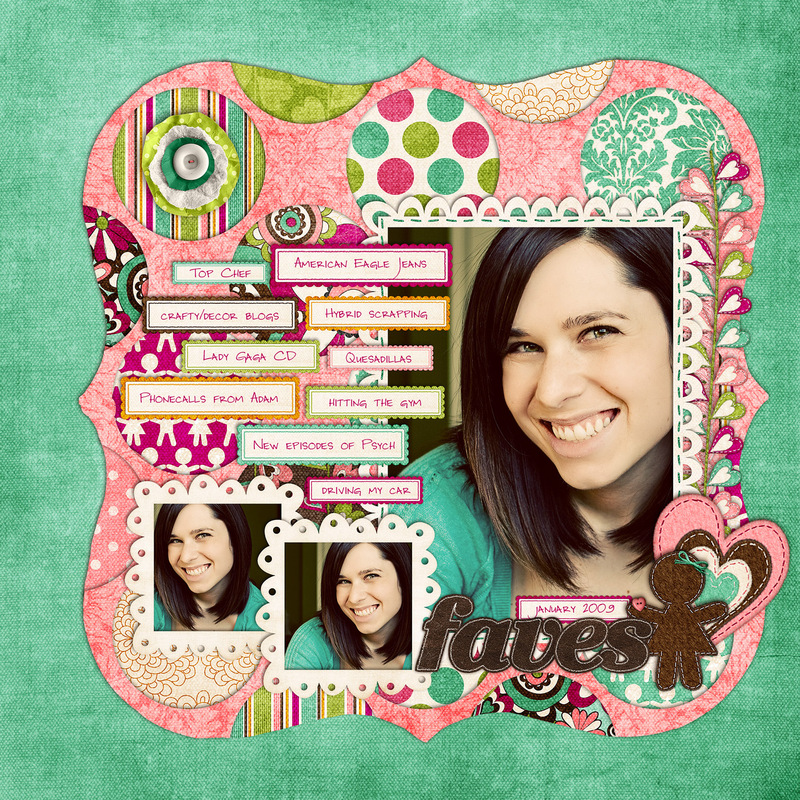 Instead you know exactly what you’re going to say, look forward to getting in front of the camera and are free to focus on the creative side of scrapbooking because you already know the end result is going to be awesome. This is why I believe every scrapbooker (including you!) should scrap a Faves page. It’s why I keep coming back to this project because I know the Faves make capturing a snapshot of my own life ridiculously easy. And who couldn’t use a bit more ease in their life? Later this week, I’ll be opening doors to the 2015 edition of The Faves Project: the Monthly Faves. 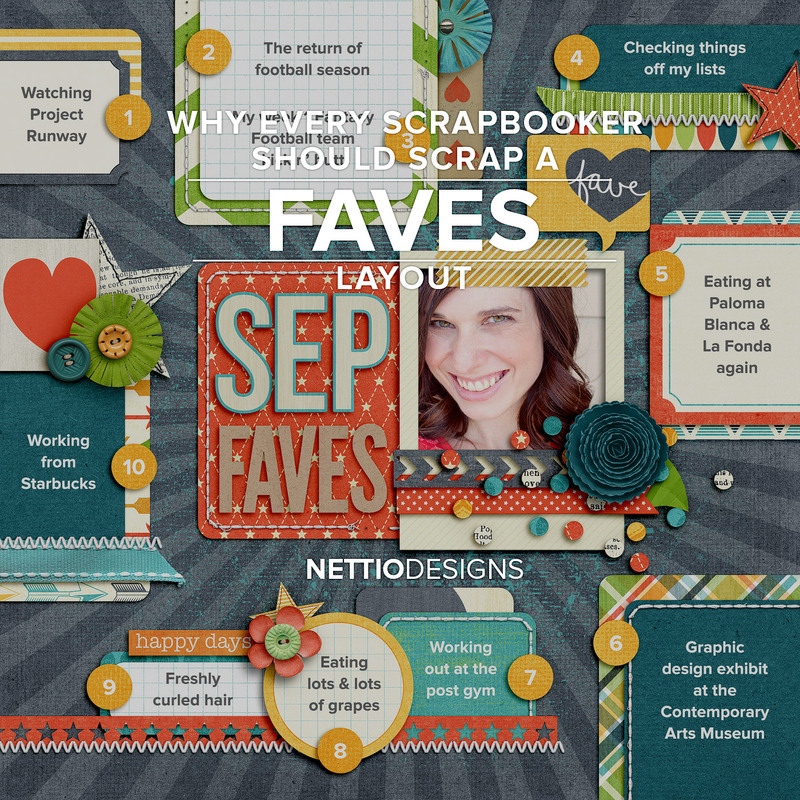 If you want to get more of YOU in your scrapbooking this year, sign up for the exclusive Faves Project list. You’ll be among the first to hear what’s in store and may even get a special bonus when the time comes. Happy Sweet Shoppe Saturday everyone! Can you believe the end of 2013 is already here? 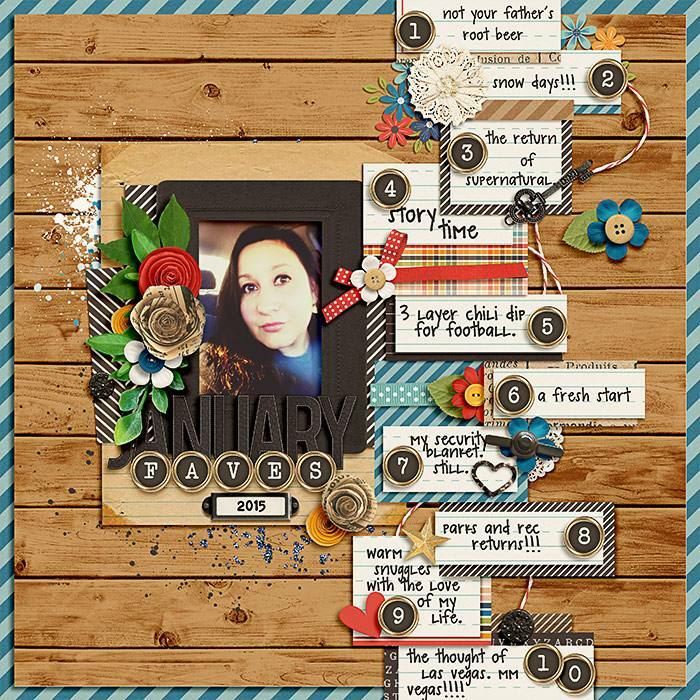 This week’s release marks not only my final New Release of 2013 but also the final release in one of my absolute FAVE (pun-intended) scrapbooking projects: the Monthly Faves! 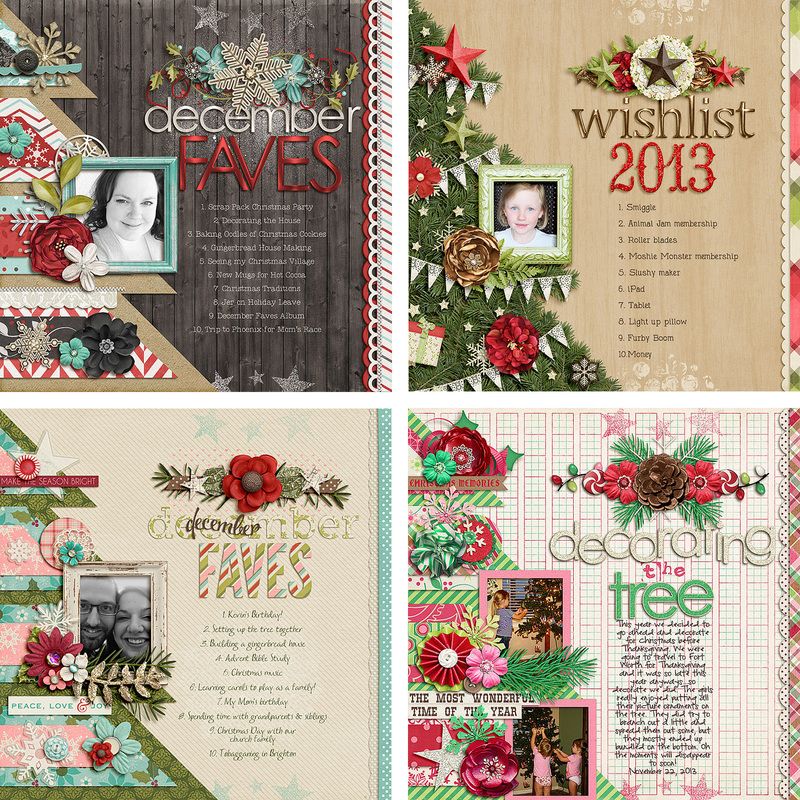 Here’s a bigger look at my 2013 December Faves layout that inspired this template. As you can see, my faves list is super random, which is exactly what I love! It’s not something you have to stress out over: make a list of 10 things, scrap it and boom, you’ve captured an easy snapshot of YOU in your scrapbooks. Just think how much fun it’ll be for you or your kids & grandkids to look back on one day! Bundle & Save on the Faves! 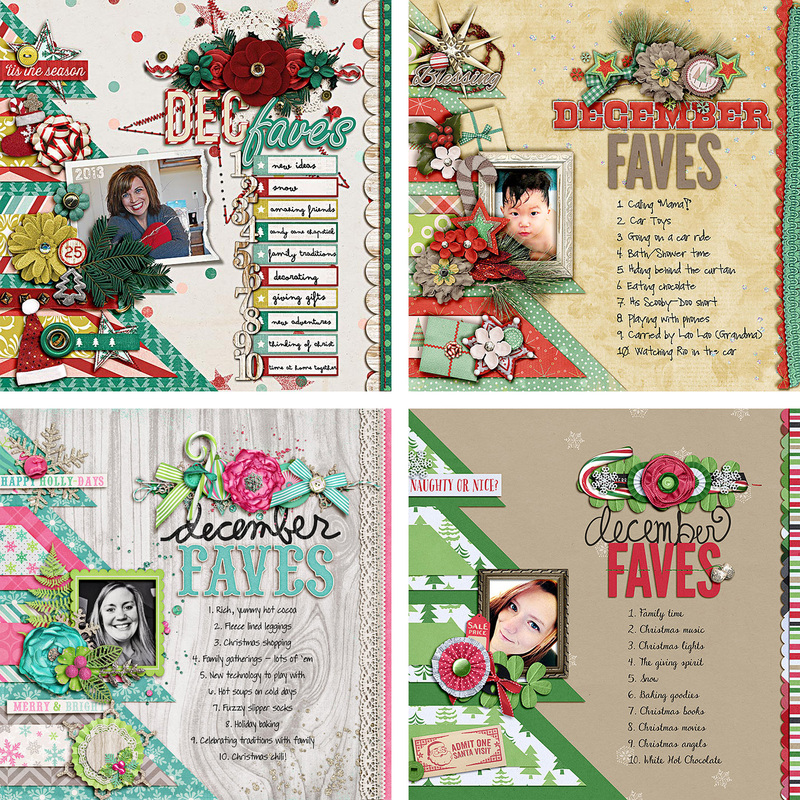 And then the complete FAVE-O-RITES 2013 Collection which includes all 12 Faves templates from this year. If you missed out on the Faves in 2013 and are thinking of doing it for 2014, these are a GREAT way to jumpstart your project. 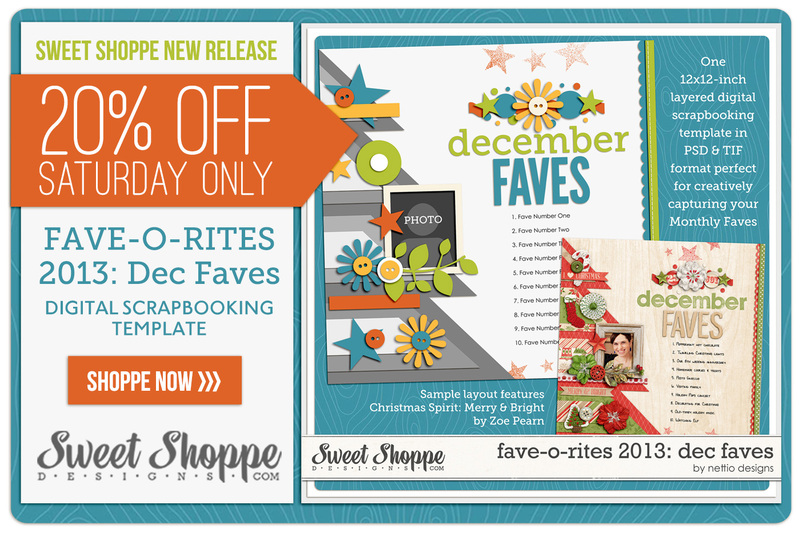 And of course, as with every Sweet Shoppe Saturday, you can SAVE 20% off all new releases thru Saturday, include the December Faves template and both Faves bundle packs. 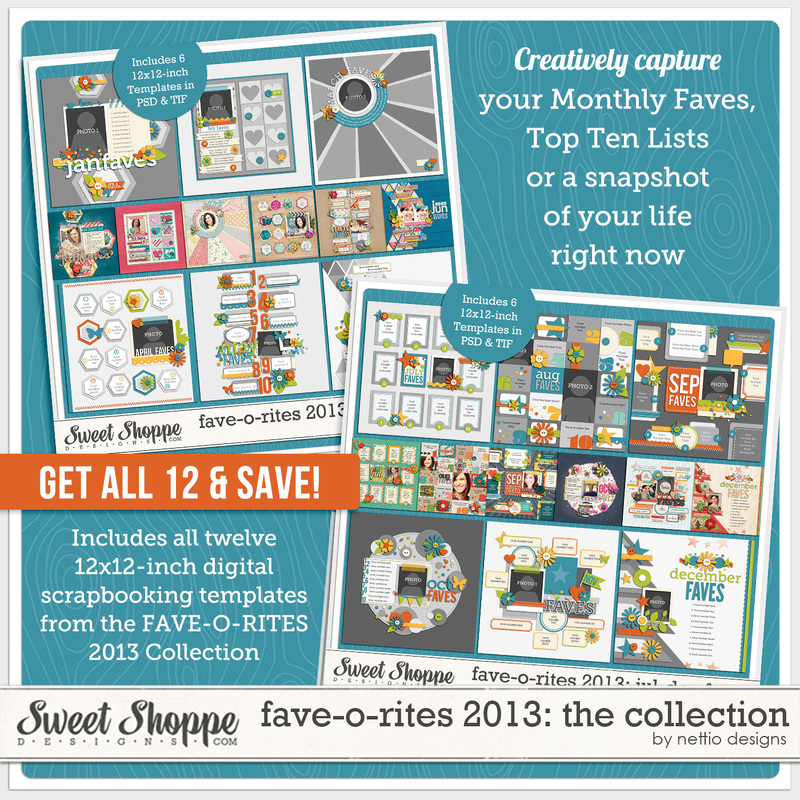 Pick up FAVE-O-RITES 2013: December Faves here today!